I’ve written of the magical, the wonderful, the fantastical fettucini Alfredo before. There are many different versions available, and in this recipe video I’ve got another for you: Fettucini Alfredo with Chicken and Broccoli. Like traditional fettucini Alfredo, this version very simple to make, and it has the added benefit working in a vegetable that’s really good for you. I’ve also added some diced chicken, and with the extra protein, the fettucini is more than substantial enough for a main course entree - of course you can always serve a small portion as an appetizer, or even pasta course for a multi-course meal. It’s also one of those dishes where you can do the heavy lifting (cooking the broccoli and chicken) ahead of time, and then put everything together in about 15 minutes of active cooking. Hope you enjoy it as much as I do. Make sure to cook the Fettucini to al dente – not over cooked. Start testing the doneness (by tasting it) a couple minutes before the package suggested time, and then check every 30 seconds or so. Remember it will continue to cook in the sauce. 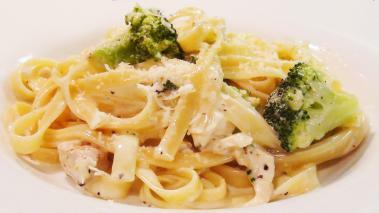 The starch in the pasta will tend to thicken up the cream sauce as they sit together. To compensate, make sure to keep the sauce a bit thinner to start with, knowing that every minute that goes by it will thicken slightly. The sauce only takes 5 – 8 minutes to make. So other than cooking the broccoli/chicken ahead of time, you can start the sauce just after starting the fettucini. I love this dish, and frankly feel a bit better about eating it with a healthy amount of fresh, perfectly cooked broccoli in there. Hope you enjoy it as much as I do. Wine Recommendation: Here are few wine pairing suggestions for fettucini alfredo from my friends at InToWine. I think I’m going to going along with the first post, and suggest the Barbara for my favored pairing. There is plenty of body and creaminess to work with a red here, and I think it will be a perfect match. Hi!!!... I was wondering what type of cream is that??? I bought philadelphia cooking cream, can i use it?? Hi there...not sure what Philadelphia cooking cream is; but anything that's labeled heavy whipping cream, or whipping cream works.